I have been the worst blogger these last few months, but it doesn’t mean I haven’t done anything with myself. As some of you might know, I’m currently changing a lot of things in my professional life, and so I needed some time to think. I also started training a lot more at the gym, so that has been taking me a bit of time (see the plan I started with). 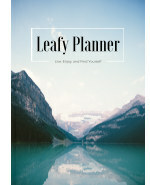 But, really, the thing that has taken me away from the kitchen is the Leafy Planner. I basically condensed my wellbeing and mindfulness practices into this planner to create not only an organisation tool, but a personal growth guide. I love to take notes and to organize my day with a planner, but I also like to doodle and track my habits. I also wanted something where I could follow how I was taking care of my body and mind. Instead of having a dozen notebooks around my desk, I’ve included everything I need in a single planner, and that’s LEAFY! Over time, the planner evolved into two different versions. The desktop one is beautifully filled with inspirational pictures from nature and printed in colour. The pocket version is perfect to take with you everywhere and in black and white. I’m now going completely out of my confort zone and trying out a kickstarter campaign to help me get some funds to print some more planners. I’d really help me out if you could take a look at my campaign and share it with your family and friends. As for the future of this blog, I’m working on improving myself a lot, and that also means changing things up with my diet. I’m feeling that inspiration is on it’s way, so stay tuned for more recipes!